The layer of the skin between the epidermis and the subcutis (subcutaneous layer). 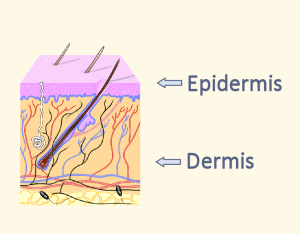 The dermis forms the bulk of the integument (skin). A protein that is deposited to form hard, tough and water-resistant epidermal (skin) tissues. Keratin forms the outer layer of epidermis, hair, nails, claws, hoofs, horns and feathers. The tough, superficial cutis (outer layer of skin) of the pad is keratinized and hairless. Under the cutis is the thick subcutis. The fatty (adipose) tissue of the subcutis provides a cushion to absorb shock during locomotion. Horny, converted into horn or horn-like tissues by the process of keratinization. 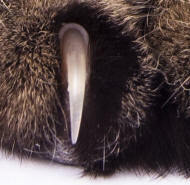 The pointed, slender and curved structure on the end of a digit (usually a toe). Made from a hard protein, keratin. The superficial (outermost) layer of the integument (skin). It overlays the dermis. 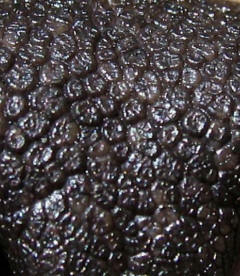 The superficial (outer) layer of the epidermis (stratum corneum) may be keratinized. The epidermis of pads is relatively soft; the cornified epidermis of claws is relatively hard.